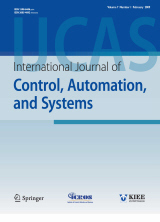 Abstract : "This paper focuses on the identification problem for a class of bilinear-in-parameter systems with an additive noise modeled by an autoregressive moving average process. By using the over-parameterization model, the special form of the bilinear term can be obtained by the model equivalent transformation. Then, we use a decomposition of the model into two synthetic models in order to separate the effect of the two sets of parameters, i.e., the coefficients of the nonlinear basis functions from the parameters of the colored noise. Moreover, two decomposition based iterative algorithms are proposed to identify the unknown parameters. A numerical example is presented to confirm the effectiveness of the proposed methods." Keyword : Bilinear-in-parameter system, decomposition, iterative identification, over-parameterization, parameter estimation.